St Peter's Cottage is a newly built three-bedroom home in an outstanding countryside location. It is situated in its own half-acre (2,000 m2) garden surrounded by open fields with views across the Blackwater River valley in every direction. The house is located next to the ancient monument of St Peter's Church, dating from the 11th century and now a stained glass artist's studio. We are delighted to be able to make the cottage available for holidays and long weekends with the opportunity to relish the tranquility of this location and as a base for exploring the outstanding Essex coast and countryside. And with London just 40mins away by train from Witham station (2.5 miles/4km) the capital is in easy reach for sightseeing. The cottage has an open-plan living space across the whole first floor comprising a generous living room and kitchen dinning area. The space has large picture windows with views over the garden, adjacent church and fields beyond. This is a space that connects with nature and will allow you to enjoy this outstanding setting in any season and in any weather. On the ground floor there are three good-sized bedrooms and a bathroom/toilet. Each bedroom has its own character and lend themselves to flexible accommodation. The green room has a kingsize double bed; the pink room and blue room can be set up as either twin or double beds. The cottage has been equipped with new furniture, fittings and appliances throughout, chosen to make every stay trouble free and relaxing. This is a perfect choice for families who are looking for wide open spaces and a wealth of attractions and places of interest. The garden has a stream running through it which is perfect for paddling but small children must be monitored at all times. There are bicycles available to use, a trampoline and a ping-pong table. There is an outdoor barbecue and we recommend Little Mountain Farm's homegrown meat; the farm can be found in Great Totham. St Peter's is located close to the Blackwater Estuary which is an area of outstanding natural beauty and with a wealth of watersports activities. Maldon (3miles/5km), is famous for its Thames sailing barges, waterside pubs and historical monuments. Big name supermarkets can be found in Witham and Maldon and there are also great places to buy local produce. We recommend Jacob's Farm in Haybridge where the vegetables and fruit are homegrown. The ancient city of Colchester is a 30 minute drive away and the Norman castle, built on the site of the ancient Roman temple houses a fascinating collection tracing the history of the region. Colchester Zoo is another local attraction which is well worth a visit. I was born the same year my parents bought St Peter's Cottage and have been lucky to spend many idyllic weekends and holidays here. Last year I rebuilt the cottage and that project has recently come to an end. 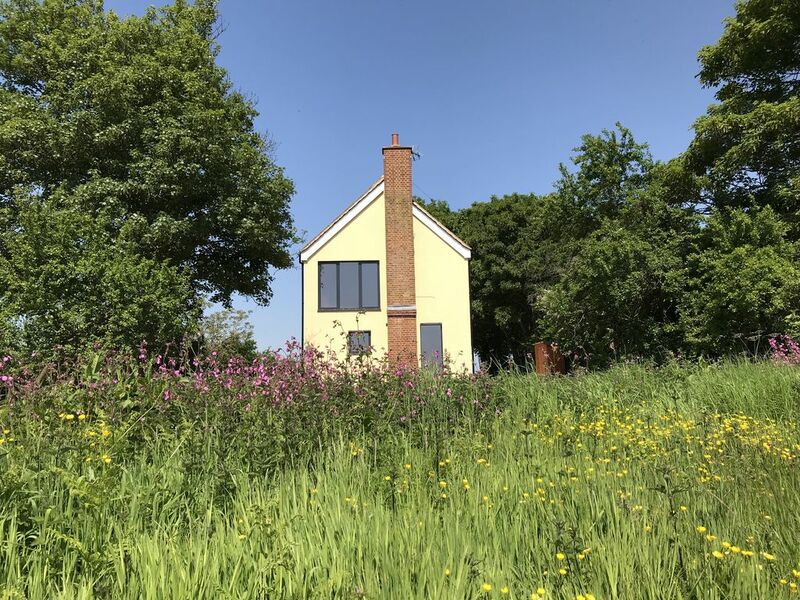 I am now able to offer this unique property for rent and I know that you will be captivated by this peaceful rural setting with so many attractions within easy reach. No neighbours, no noise, just the English countryside at its best in any season. Space to play or just relax and just beyond the beautiful Blackwater River valley stretching away in every direction. Take a stroll along the river bank or take to bicycles and head off further afield. A car will greatly enhance your visit, opening up spectacular Essex landscapes, historical villages and towns and a wide range of attractions. My team had a great stay here and it was both a peaceful and convenient location for their work touring schools across Essex. Wonderful location surrounded by fields, adjacent to an ancient chapel that is now the studio of renowned stained glass artist, Benjamin Finn. His windows in the chapel are absolutely stunning. The simplicity of the house lets the countryside speak for itself. It is close to most places of interest in Essex. We think it's ideal. The swing made my daughter very happy. We were too busy to get round to using the table tennis table, but the bikes were fun for the boys. Bedrooms are downstairs and disabled accessible. We brought my dad who is in a wheelchair, but can walk a little, we just managed to get him up and down the stairs to the living area once a day. We also brought a bath seat to use over the bathtub. Eating outside is an option.